British Virgin Islands (BVI) is the leading offshore jurisdiction with high degree of market awareness and acceptability. BVI is a group of islands in the Caribbean Sea located approximately 80 kilometres east of Puerto Rico. 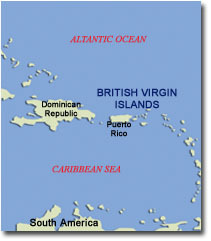 BVI is a British Dependent Territory which became self-governing in 1967 and is a member of the British Commonwealth. Since introducing its International Business Company (IBC) legislation in 1984, the BVI offshore financial services sector has developed, and is now the world's most popular offshore centre with around 700,000 companies incorporated. The legal system is based on the English common law supplemented by local ordinances. There are no taxes levied on BCs with the exception of the annual government licence fee. Companies that fail to pay their licence fee by the due date are subject to penalties and will be struck off for non-payment five months after the due date. Minimum of 1 shareholder, either natural person or legal entity can be a shareholder, any nationality except BVI residents.